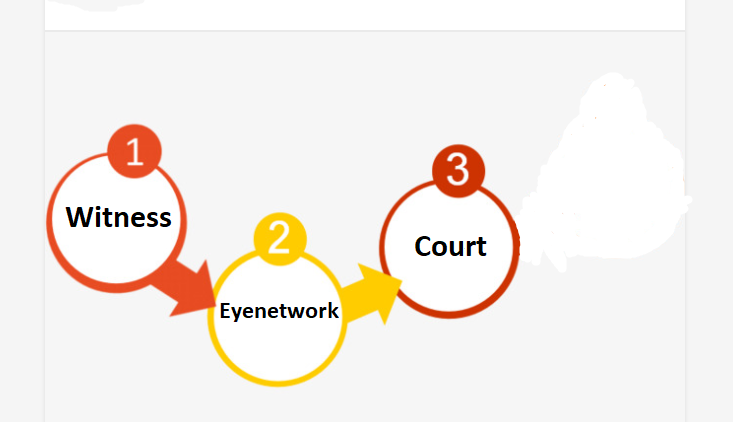 Eyenetwork has been connecting courts in England & Wales for over two decades and we are experts in the field of video Courtlinks. Through years of experience, we have found ways to simplify the confirmation process for our customers and we also understand which parts of the booking stage they struggle with the most. Eyenetwork is needed to establish the connection between the Court and a witness. Our Bridge is used to link both parties (or more) in a virtual room where the meeting will take place. If the court has an ISDN dial up number, they will be able to provide you with it upon request. The number will look like a local telephone number, as ISDN connections are made via phone lines. If that is the case with the connecting court, all you are required to do is provide Eyenetwork with the court room ISDN number upon the booking being confirmed. TEST CALLS: The court must telephone Eyenetwork to arrange a test call once the booking has been confirmed. They need to have the Eyenetwork booking number and confirm with us a date and time the court room is free to run the test. We will accommodate to our best ability, but preferably we would need at least 24 hours’ notice. All that remains is for the court to telephone us on the day of the meeting when they are ready to connect, and we will dial out to the number provided & connect them to the witness. 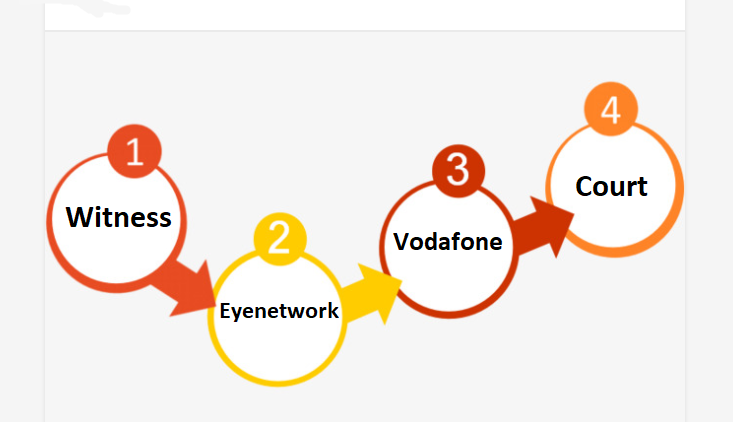 Some courts do not have ISDN numbers, so they connect their Videolinks via a company called Vodafone Involve. If this is the case, the Vodafone Bridge must be booked in addition to the Eyenetwork Bridge. Once booked, the Vodafone Bridge generates a unique ISDN Dial Up number for the Courtlink. Once supplied, this number must be passed onto Eyenetwork so we can dial it on the day of the hearing & connect the court to the witness. Sometimes the courts inform our clients they have an IP address, which is also on occasion mistaken for an ISDN number. If they supply a number starting with 8875 or 8874 – then this is an IP address. This means they connect their Videolinks via Vodafone and therefore the Vodafone Bridge MUST be booked. Vodafone Involve bookings are made by completing their booking form, which we attach with our quotes, should they be required. The booking form requires the date, start time, duration, name of the court and the courtroom number on it. It must be sent to Vodafone at least 24 hours before the Videolink is due to take place. Please note if Vodafone is not booked at least a day in advance they may not be able to provide the Dial Up ISDN number that is required to connect the court. The Videolink will not be able to proceed without the Vodafone Involve number. Also note that the Vodafone service is free, so just to be on the safe side we recommend booking the link for longer than required, for example, if your meeting is scheduled from 10:00 to 12:00 it is best to book Vodafone from 09:00 to 14:00. If your call overruns, it could get disconnected as Vodafone will cut off the call the minute your booking time runs out. TEST CALLS: If the connecting court connects via Vodafone Involve then Eyenetwork will NOT participate in the test call. This is because we connect to Vodafone daily and our Bridge is certified with theirs – we are confident the connection will work. The test needs to be carried out and arranged between Vodafone and the court only. On the day of the hearing, the court needs to telephone Eyenetwork when they are ready to connect with the witness, and we will dial out to the Vodafone ISDN number provided. Vodafone should already be connected to the court but in some instances, they are not, in which case you will have to telephone Vodafone and instruct them to do so. They can be reached on 01305 752 104. To those with little experience of Videolinks, the booking process will seem complicated at first. Eyenetwork are always on hand to provide technical support, and we are always available to assist clients with any further questions they might have. If you have any questions, please do not hesitate to contact us via telephone on 01273 324422 or e-mail at eyenetwork@kinly.com.